We are somewhat loathe to put out yet another piece about what might happen in the markets as it risks focusing long-term, sensible investors’ minds on short-term events. The referendum on Scottish independence, Grexit, China’s slowdown and most recently Brexit, have come and gone, in market terms, with most investors sitting on healthy increases in their portfolios since 2014, despite uncertainty at the time. However, it is not a bad thing to revisit the robust rationale for the structure of our client portfolios, particularly at such a time. With less than a week to go before the US citizens exercise their democratic rights and responsibilities, the race between the two Presidential candidates – love them or loathe them – looks too close to call. This campaign has, perhaps, brought out the worst of the US electioneering process between two polarising candidates, with much talk of a least-worst outcome. At times it has been unedifying, to say the least. Yet by this time next week, the world will have a new US President. No-one ever said that democracy was easy. From a market perspective, share and bond prices, along with exchange rates, reflect all publicly available information, which includes the aggregate market view on both candidates, their economic and foreign policies and the various scenarios of who wins the House of Representatives and who wins the Senate. It is therefore next to impossible to second-guess, at this point, what might happen to markets in terms of directional movements. What we do know is that, like Brexit, there is likely to a lot of uncertainty, which will be reflected in market volatility, as events unfold, and market participants try to make sense of the outcome delivered by the US people. It is also worth remembering that it does not really matter which party is in power, from an equity market perspective. The relentless growth of the US (and global) economy, driven by the desire of the private sector for profit, is ultimately reflected in dividends paid to investors and the real growth in corporate earnings that leads to stock price rises over the longer-term. Time is your friend. 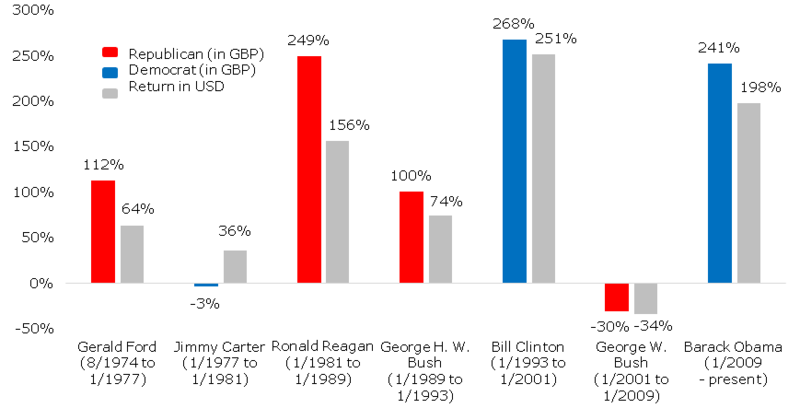 Figure 1: Cumulative, nominal return – US equity market 1970-2016 in GBP and USD. Data source: MSCI US Index TR from Morningstar Direct © Copyright. All rights reserved. Your equity holdings are highly diversified: holdings are diversified across global economies (emerging and developed), across sectors and by individual companies. Although the US represents around 50% of the global equity markets, it is worth noting that around 45% of the sales of goods and services of S&P 500 companies are made outside of the US. Your bond allocations are defensive in nature: in the event that bond yields rise, again it is worth noting that US bonds form only part of the bond allocations held in portfolios and, where they are held, they tend to be short-dated bonds which are less sensitive to rises in yields (price fall) than longer-dated bonds. The majority of bonds held in portfolios are of very high credit quality, which tend to do better at times of market uncertainty, compared to lower quality bonds. Your bond exposure is fully hedged, whilst equity exposure is unhedged: if the US dollar depreciates, then for investors with non-dollar portfolios, this could have a negative effect on performance. Any clients with US dollar portfolio will conversely benefit. However, as indicated above, 50% or more of the equity assets are in non-dollar assets and the 45% of overseas sales made by US companies will now be worth more in US dollar terms, supporting the US market. A similar phenomenon has been seen in the UK, post-Brexit. The bond allocation in portfolios will be largely unaffected by currency movements. Be it Clinton or Trump, they are only the vassals of the people. S&P Dow Jones Indices (July 2016), S&P Foreign Sales at 44.3%, Lowest Level since 2006.